Andhra Pradesh’s farmers gifted 68 paisa Cheque to PM Narendra Modi on his birthday to show their peaceful protest. Rayalaseema Saguneeti Sadhana Samithi, a Kurnool-based NGO has sent the cheque to highlight the neglect of the backward Rayalaseema region of Andhra Pradesh. Some of the members are farmers who are in distress due to the continuous drought-like situation in the region, B Dasarath Reddy, president of the Samithi said. “Many rivers flow through the region but due to lack of irrigation and drinking water projects, farmers and people in this region face water shortage. We want to highlight our problems at the highest level so we are sending these cheques,’’ he said. Although, it is Modi’s 67th birthday some members assumed it was 68th and made out cheques accordingly. 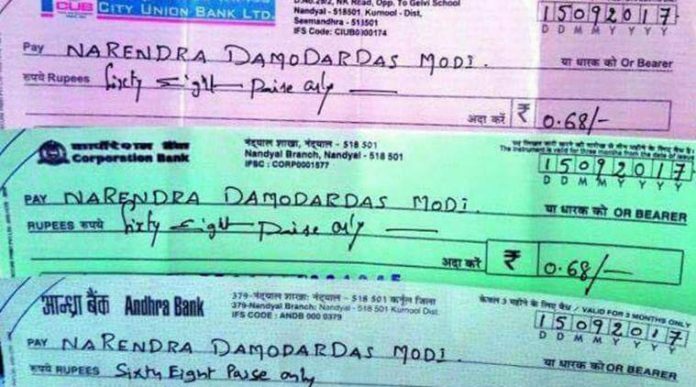 The six cheques of which Reddy displayed photos were made out to Narendra Damodardas Modi and dated September 15. “We are sending 68 paise cheques as a token to draw your attention to our backwardness,” RSSS co-convener Yerva Ramachandra Reddy said. The group claimed that Rayalaseema remains one of the most backward regions in the country despite the abundant resources there. Kurnool, Anantapur, Chittoor, and Kadapa districts are deprived of water despite rivers like Krishna and Penna passing through it. “The infrastructure projects taken up are coming up at a slow pace. Lots of things like steel plant, universities, railway zone etc were promised but there is no visible development,’’ Reddy said.Earlier, the Samithi had written to Andhra Pradesh Chief Minister Chandrababu Naidu who replied that the irrigation and drinking water projects were progressing as planned and the region would be drought-proof soon.